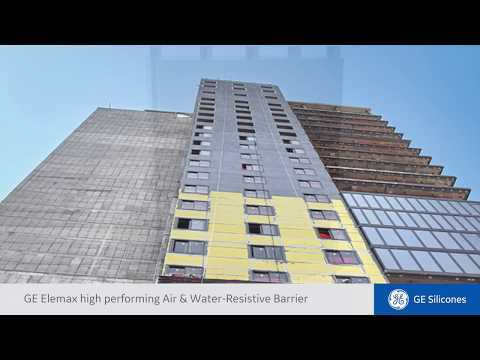 Elemax* 2600 AWB can deliver seamless, long-lasting protection for your building envelope. Made from naturally resilient 100% silicone, it works to prevent air and water leaks, thus helping to control moisture and humidity inside your building—maintaining air quality and energy efficiency for years to come. A single coat of Elemax 2600 AWB cures quickly to form a membrane that is both vapor-permeable and airtight. It is UV-resistant upon cure, and maintains its elasticity even after years of exposure to weather extremes. Elemax 2600 AWB securely bonds to virtually all substrates, and remains waterproof, intact, and airtight decade after decade. Elemax 2600 AWB is backed by world-class technical support and extended warranties of up to 20 years. Standard color is black to accommodate open joint rain screen systems. Grey and white are currently available as a special order.